He entered this world on Friday the 13th and exited on April Fools Day. In the 37 intervening years, Rube Waddell struck out more batters, frustrated more managers, and attracted more fans than any pitcher of his era. An imposing physical specimen for his day, the 6-foot-1, 196-pound Waddell possessed the intellectual and emotional maturity of a child — although a very precocious and engaging one at that. "There was delicious humor in many of his vagaries, a vagabond impudence and ingenuousness that made them attractive to the public," wrote the Columbus Dispatch.1 Waddell's on- and off-field exploits became instant legends. Waddell's antics have become the stuff of legend, occasionally embroidered to make this larger-than-life character appear even more preposterous. No, Waddell didn't regularly bolt from the mound to chase a passing fire wagon. But his fascination with fires was genuine. He regularly assisted firefighters, from a bucket brigade in Pewaukee, Wisconsin to large metropolitan departments in Philadelphia, Cleveland, Detroit, or Washington. Yes, on occasion Waddell did direct his infielders to the sidelines and strike out the side in the final inning—but only in exhibitions, never in a regular-season game. One of the great myths concerns Waddell's background, which helped perpetuate the "rube" or hayseed image that adorned his career. Contrary to popular presumption, his father was not a farmer. John Waddell, a native Scotsman, labored in the Pennsylvania oil fields as an employee of the National Transit Company, a division of Standard Oil. While living in Bradford, Pennsylvania — at one time the center of the world oil production — John's wife, Mary Forbes Waddell, gave birth to their sixth child on October 13, 1876. Christened "George Edward," the future "Rube" Waddell was also known as "Ed" or "Eddie" in family circles. In the early 1890s the Waddells relocated to Butler County, Pennsylvania and settled in the town of Prospect. In Butler County and the surrounding area, the reputation of a burgeoning pitching talent began to grow. Teenager Ed Waddell swiftly advanced from the sandlots to play for a number of semipro baseball teams in the region. In August 1896, newspapers in Titusville and Oil City made passing mentions of an Oil City pitcher named "Rube" Waddell, the first known references to his famous nickname. The visiting Louisville Colonels saw promise in the young left-hander and signed him. Rube made his major-league debut on September 8, 1897, a 5-1 loss to Baltimore, the defending league champion. A week later, he relieved in a lost cause against Pittsburg. Louisville management believed Waddell needed more seasoning before testing the majors for a full season. Accordingly, he began the 1898 campaign with Detroit of the Western League. The relationship didn't last long. Waddell pitched in nine games for Detroit before he left the team after a squabble over a fine. He pitched briefly in Chatham, Ontario and finished the year in Homestead, Pennsylvania. Waddell returned to the Western League in 1899 with Columbus, Ohio, where he enjoyed his first successful season in organized baseball, as he notched a 26-8 record for Columbus and Grand Rapids before rejoining Louisville in the final month of the season and winning seven of nine decisions. Prior to the start of the 1900 season, the Louisville franchise was contracted from the National League, but Colonels owner Barney Dreyfuss purchased a half-interest in the Pirates and arranged for the "trade" of 10 of his players to Pittsburg, including Waddell. Pitching for Pittsburg, Waddell paced National League pitchers in 1900 in ERA (2.37) and was second in strikeouts (130), but also finished with a losing record (8-13) and missed nearly two months of the season. Fred Clarke, the Pirates' player-manager, was a strict disciplinarian and had little use for Waddell's irresponsible nature. In early July, Clarke suspended Waddell, who then hooked up with a number of semipro teams in western Pennsylvania, finally landing in Punxsutawney. Connie Mack, then manager of Milwaukee's American League team, was in need of pitching. He received permission from Pittsburg to sign Waddell, with the stipulation that Waddell would return to the Pirates if they so desired. Mack convinced Waddell to leave "Punxy" and the southpaw became an immediate sensation in Milwaukee. He won 10 games in a little more than a month, including both halves of a 22-inning doubleheader at Chicago. Impressed by Waddell's work with the Brewers, the Pirates asked for his return. Clarke and Rube survived the remainder of the 1900 season without major eruptions but more problems arose the following season. In May 1901 Waddell's contract was sold to the Chicago Orphans. After winning 14 games (in 28 decisions) for the struggling Chicago team, Rube jumped ship again and landed with a number of semipro teams in Wisconsin. In November Rube hooked on with a barnstorming team for a tour of California. Extremely popular with the West Coast fans, Rube signed with the California League's Los Angeles Looloos for the 1902 season. Waddell stayed in Los Angeles for only a few months before Mack, now managing the Philadelphia Athletics, enticed him to leave California to bolster the A's depleted pitching staff. Waddell agreed, and Mack sent a pair of Pinkerton escorts to ensure Waddell made it east. Only 87 games remained on the A's schedule when Waddell pitched his first game on June 26, yet the left-hander finished the season with a 24-7 record. Rube also led the league with 210 strikeouts, 50 more than runner-up Cy Young, who pitched 108 1/3 more innings. The Athletics, only two games above .500 when Rube entered the fray, finished 30 games above the break-even mark and won their first American League pennant. In little more than half a season Waddell had established himself as one of the game's premier pitchers and Philadelphia's most bankable star. The Athletics' attendance doubled from the previous year to a league-leading 420,000. Cigars, soap, and liquor were among the products named after Waddell. The 1902 season also saw the emergence of Osee Schrecongost as Rube's favorite catcher. Waddell and Schreck (as his name was often truncated) soon became known as baseball's wackiest battery mates, as famous for their off-the-field frolics as their on-field production. After numerous disagreements over advance pay, the company jettisoned Rube during its run in Philadelphia, unceremoniously dumping his bags in the alley.9 He immediately began tending bar in nearby Camden, New Jersey. His 1904 campaign progressed without serious incident. Waddell won 25 games and registered a 1.62 ERA, the second-best of his career. He also extended his post-1900 single season strikeout record to 349, a major-league total unsurpassed until Sandy Koufax whiffed 382 in 1965. The 1905 season was even better for Waddell, at least statistically. He led the AL in strikeouts (287) games pitched (46), ERA (1.48) and wins (27). His most spectacular victory was a 20-inning contest against Boston's Cy Young on July 4, 1905. Both future Hall of Famers went the distance and Rube performed cartwheels off the mound once the A's secured the 4-2 victory. According to legend, Rube bartered free drinks with the ball he used to defeat Young in the game. Before long, dozens of bartenders had this "genuine" souvenir in their possession. Despite this success, the 1905 season ended on a sour note for Waddell. Again, he missed most of the season's final month. After another Waddell victory over Young at Boston on September 8, the A's headed back home to Philadelphia. While changing trains in Providence, Waddell and teammate Andy Coakley engaged in a friendly scuffle over a straw hat. 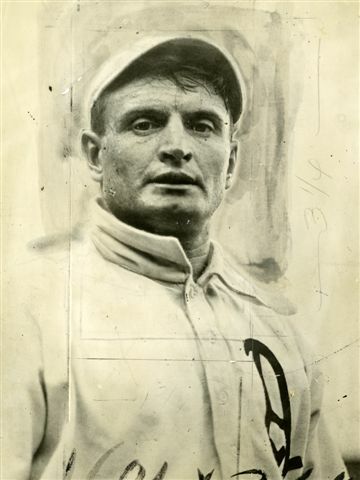 Rube fell and injured his shoulder.11 His season was over, with the exception of two ineffective appearances in the last two days of the regular season, and he did not appear in the Athletics' five-game defeat to the New York Giants in that year's World Series. Not everybody believed the straw hat tale, however. Rumors were rampant that gamblers had paid Waddell to sit out the series. Mack believed Waddell was never quite the same after the straw hat incident. In 1906 Waddell's ledger sagged to 15-17. Despite his losing record, Waddell ranked among the league leaders with eight shutouts, including a one-hitter over the Detroit Tigers. Waddell's drinking problem escalated during the season, and a rift developed between Waddell and Schrecongost, who had sworn off the bottle. In 1907, Rube improved his record to 19-13 but he was ineffective down the stretch as the A's fought tooth-and-nail with Detroit for the AL pennant. In a key game against the Tigers on September 30, Waddell came on in relief of Jimmy Dygert and failed to hold a three-run lead. Although the game ended in a 17-inning deadlock, the Athletics' collapse was a crushing blow to their pennant hopes and proved to be Waddell's death knell in Philadelphia. In the "interest of team harmony," Mack sold Waddell to the St. Louis Browns on February 7, 1908—a week after Waddell's wife sued him for divorce. Shortly afterward, Waddell was accused of assault and battery on both his parents-in-law.12 The resulting legal difficulties prevented him from pitching in Massachusetts, where a warrant for his arrest awaited, during the 1908 and 1909 seasons. Waddell responded with another 19-win season in 1908, helping the much-improved Browns to stay in the pennant race, though the club faded to fourth place by season's end. Not quite the dominant force he once was, Rube was still a box office bonanza. "He paid for himself in three games after he was bought," wrote St. Louis Post Dispatch columnist John L. Wray. "He had added many thousands to the exchecquer [sic] since that time--paid admissions that would never have arrived at the gate but for the fact that Rube was scheduled to work. "13 The Browns enjoyed a 48 percent boost in home attendance to more than 618,000, second in the American League, while the Athletics' attendance dropped by nearly 30 percent. On July 29, Rube enjoyed a measure of revenge against his old mates when he struck out 16 Athletics, tying the American League single-game record. In 1909, Waddell's record slipped to 11-14 with only 141 strikeouts, as his skills began to show obvious decline. His 2.37 ERA was barely better than the league average. On April 4, 1910, after his ugly divorce from wife no. 2 was finalized, Rube married wife no. 3, 19-year-old Madge Maguire. Another tempestuous marriage followed. Rube's major-league days were also numbered. He appeared in only 10 games, all but two in relief. The Browns released him in August, leaving him to finish out the year with Newark in the Eastern League. In 1911, Waddell won 20 games for Joe Cantillon's Minneapolis Millers, helping the Millers to another American Association championship. The following winter, Waddell lived with Cantillon at the manager's farm in Hickman, Kentucky, a small village situated on a bend of the Mississippi River. When flood waters threatened to swallow the town, Rube stood in icy water for hours helping stack sandbags for the levee. As a result, he contracted a severe case of pneumonia. His system weakened, Waddell soon became a victim of tuberculosis. He pitched one more season for Minneapolis and a part of another with two teams in the Northern League but by November of 1913 his health had reached the critical stage. The once powerful Waddell, now down to 130 pounds, passed away on April 1, 1914, a few months shy of his 38th birthday. "He was the greatest pitcher in the game, and although widely known for his eccentricities, was more sinned against than sinner," said Mack. "He may have failed us at times but to him, I and the other owners of the Athletics ball club, owe much. "15 He was laid to rest in Mission Burial Park South, in San Antonio. An earlier version of this biography originally appeared in "Deadball Stars of the American League" (Potomac Books, 2006), edited by David Jones. It also appeared in "From Spring Training to Screen Test: Baseball Players Turned Actors" (SABR, 2018), edited by Rob Edelman and Bill Nowlin. Interview Bill Waddell, great-nephew of Rube Waddell, ca. 2005-06. 1 Columbus (Ohio) Sunday Dispatch, April 5, 1914:14. Repeated in The Literary Digest, April 18, 1914. 2 Grantland Rice, “Sportlight,” Indianapolis Star, October 18, 1944: 15. 3 Personal conversation with Ruth Mack Clark, ca. 2005-06. 4 Louisville Courier-Journal, September 16, 1897: 6. 5 “Rube Waddell’s Wife Obtains A Divorce,” Springfield (Ohio) Sun, April 6, 1902. 6 Washington Post, July 19, 1903: H10. 7 Philadelphia Evening Bulletin, September 1, 1903: 11. 8 Chicago Journal, October 12, 1903. 9 F.C. Richter, “PHILADELPHIA NEWS/The Erratic Waddell's Theatrical Career End,” Sporting Life, December 26, 1903: 5. 10 Connie Mack, “The One and Only Rube,” Saturday Evening Post, March 14, 1936, Vol. 208 Issue 37: 12-110. 11 J. G. Taylor Spink, ed., “Rube Waddell/His Life, Laughs and Laurels,” Baseball Register, St. Louis: The Sporting News, 1944), 16. 12 Lynn (Massachusetts) Daily Item, February 9, 1905: 1. 13 John L. Wray, “Wray’s Column,” St. Louis Post Dispatch, August 15, 1909: 29. 14 “Shibe And Mack Will Look After Rube Waddell,” San Antonio Express, February 20, 1914. 15 Philadelphia North American, April 2, 1944.